Generally, the living and dining areas have marble tiles. Bedrooms: timber strips. The kitchen is small for the 3000 sq. ft units. The utility area may have a stack up dryer and washer as well as a conventional oven as there's no space in the kitchen. The "maid's room" is usually too small or non existent. This affects rentability. Kew Gate: swimming pool, playground, BBQ area, jogging track, 24-hour security system, clubhouse, covered car park and multi-function room, club house, sauna. Kew Green: Swimming pool, small gym, playground, BBQ area, jogging track, 24-hour security system, clubhouse, covered car park and multi-function room (aerobic room) in club house, sauna. See pictures below and in Kew Green townhouse hunting. Cable connections are said to be available in April 2002 Numerous young Caucasians like Kew Green as they can barbecue in their garden and sun bathe or entertain on the roof terrace as well as relax in the roof top jacuzzi. 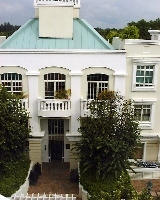 Kew Residencia: swimming pool, gym, playground, BBQ area, jogging track, 24-hour security system, clubhouse, covered car park and multi-function room, club house, sauna, jacuzzi. Completed: 1998. Much cheaper than renting house with pool. 5-minute taxi to Changi Airport. Suits expats who fly frequently. More living space/dollar rental compared to any condo, yet you get a communal pool and other facilities. More storage space for expat families with lots of furniture as built up areas exceed 2,000 sq. ft usually. Security guard and covered car parking lots. No tennis and squash courts and cable television connections in all 3 developments. Will not suit energetic singles or young couples who want full condo facilities. Complaint by expatriates with young children, of too many stories and steps to climb. Rooms may be smaller than those Kew Green townhouses. No tennis court, no cable points. The 457 sq. m units have bigger rooms. No maid's room. 193-366 sq. m. A small roof terrace outside the 3rd floor. The 4th bedroom is at the basement and there's no maid's room. 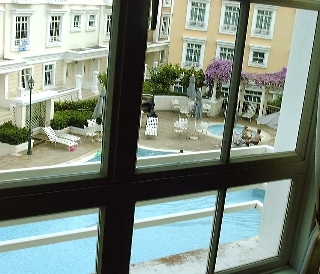 Unit's window facing pool and clubhouse may be noisy if there are screaming children. Very few swimmers in this cluster housing, even on weekends. The townhouses seen face the road in front and pool behind. Roof top terraces with jacuzzi are extremely attractive to younger Caucasian expats. Small swimming pool and spa pool. Plenty of sunshine for Caucasian sun lovers. Unit facing the Upper East Coast Road and tall green trees. There's a slight traffic noise if you open the sliding doors. Smaller unit of around 3000 sq. ft built in areas with excellent back to nature green tree views but faces the Upper East Coast Road. There's a garden below the living area. A bigger unit of 3600 sq. ft built in area. 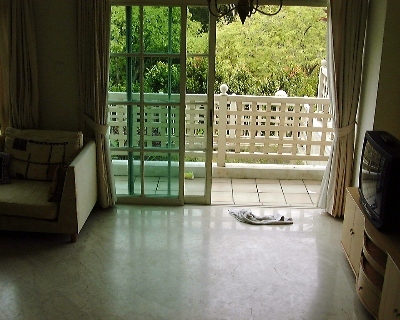 There is a larger living and dining spaces if the owner does not put up wooden partitions. A bigger kitchen. Bigger dining chairs with chair pads will be a better investment as most tenants are Caucasians. Smallest unit of 3000 sq. ft built in areas, has sufficient space for a small dining table and sofa sets. It is best not to use curtains than vertical blinds as they don't last at the bottom edges. Over 3600 sq. ft bigger units have large dining and living areas. Landlords should dismantle wooden divider (not seen in this unit) separating the living and dining rooms if they want to rent fast. The divider reduces the width of the area and most Caucasians do not appreciate them as they have lots of furniture to shift in. Over 3600 sq. ft bigger units have bigger kitchens too. A wall mirror makes the dining area look so much bigger. Use neutral or pastel colours if you do not want to spend money changing brown curtains for Caucasian expat tenants who usually don't appreciate dark colours. Clubhouse with gym at 3rd level, aerobics room at 2nd level and management office at basement car park level. A small gym directly in front of the lift's door. The gym appears crammed and claustrophobic. However, the townhouses have garden spaces to enable the Caucasian expatriate to enjoy his barbecue. A big multi-function room facing green trees on 2nd level of the clubhouse. Units are available for rent at various times. Case study 1: TIPS FOR LANDLORDS. Returning pro-rated commission when the Tenant breaks lease. "The Occupant, Mr Tsumura is still in the apartment" said the co-broking agent. She did not know that the Tenant's employee had handed over the unit 4 days ago, prematurely terminating a two-year lease by 6 months. "The Accountant had prepared the cheque" said the co-broking agent Ms Yoko when pressed for the refund of pro-rated agency commission. The Landlord had paid promptly one month's rent for a 2-year lease but the Tenant had used the diplomatic clause to terminate the lease and therefore the pro-rated agency commission ought to be returned as stated in writing. A letter dated June 14 was faxed and posted to her with the written evidence of break lease by a large Japanese Corporation which was serviced by her agency followed by a phone call. She was unhappy and slammed the phone down when asked when the cheque would be ready! The General Manager of this realty firm promised to investigate and call back but did not do so. When called, he said there could be some communication problem. The General Manager was told that there was a written undertaking from his company to return the pro-rated commission. It was a co-broking case and Asia USA represented the Landlord. If he would not honour the promise, then the matter would be referred to his Managing Director. The Corporate Tenant which was asking for the return of the security deposit would be informed that its retained realty firm had not honoured its written undertaking. Avoiding payment is a common incidence amongst many co-broking agents but it should not happen in a big realty firm. In 2001, most tenancy agreements have the condition that the Tenant returns the pro-rated agency commission if the Tenant exercises the diplomatic clause. This would solve the problem for the Landlord. Case study 2: TIPS FOR LANDLORDS. The Landlord caused ill will by misrepresentation. It had been difficult to rent this Kew Green townhouse in the recession of 1999/2000. The Landlord's agent had advertised for 3 months and had seen me 3 times with different expatriates but there was no closing. His big "For Rent" sign had been prominently displayed on the window but there was no takers or referrals from expatriates in the cluster housing. It seemed, to him, that the agents with prospective tenants did not "push" his unit as they would have to share 50% of the commission. This is correct in the internet era. Agents just get listings of Landlords easily by subscribing to an internet service. Therefore, he had advised the Landlord to advertise as "Owner". The Owner confirmed he would pay full agency commission when I made the appointment. The Owner failed to turn up and I had to phone him when I reached the house. Who turned up? The same agent who said to me: "You again!". This was a case of a Landlord misleading agents with "Owner" advertisement to get their units short listed for viewing. The Landlord then sent his realtor to open the house. This became co-broking case where commissions are split 50:50. Ethical realtors should state that they represent the Landlord but "full commission" will be payable, to avoid charges of misrepresentation. Landlords should be ethical as they are in the investment business and a bad reputation of using "owner's" advertisement to get their units rented out fast will be bad for business. This realtor who turned up was ethical enough to say that full commission will be paid although he did not state upfront. It must be difficult for him to run around for the Landlord without "payment". If the Landlord wants his realtor to do the leg work, he should pay his realtor for managing the property, otherwise the realtor may have no motivation to turn up to open the house. 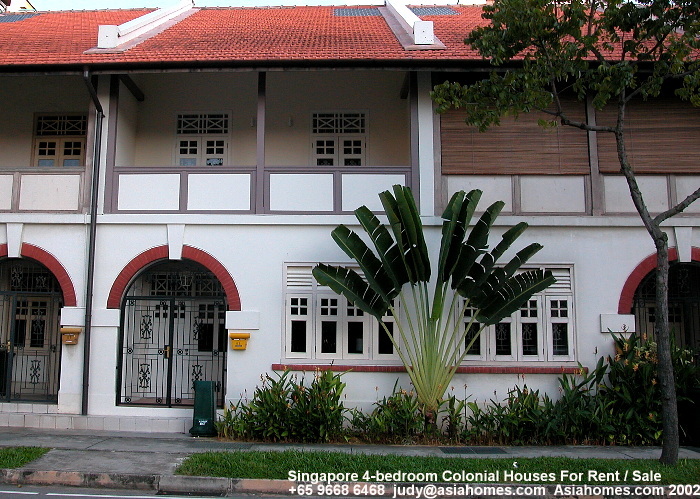 All realtors, or almost all realtors in Singapore are self employed and many have difficulties making ends meet in this downturn of the property cycle.